Calling all adventure travel lovers: 2019 is the perfect year to visit the neighbor to the north. Head to Canada in the winter for a number of incredible outdoor adventures. If you’re hoping to have a bit of an outdoor adventure this winter, you don’t have to travel far. It’s just a quick flight (or drive) up north from the United States to Canada—one of 2019’s hottest destinations. There, snow, ice, and endless landscapes to await. Don’t stay home and hibernate—from Quebec to British Columbia, there’s a lot to explore. Pack your warmest clothing in your versatile backpack and get ready to try dog sledding, see polar bears, or just chill out in a ski lodge in Whistler. (Your warmest winter clothes can be notoriously bulky, but use a compression packing cubes so you can fit more sweaters.) Here are a few trip ideas that shouldn’t be missed. Half way through, you’ll head out to a tepee with a log fire for hot cocoa and cookies are waiting before returning to the kennel. Kids are welcome, too, they just must be over 10 years old to drive, so bring the whole family. When to visit : Usually open December-March. Call to confirm there’s enough snow to sled. 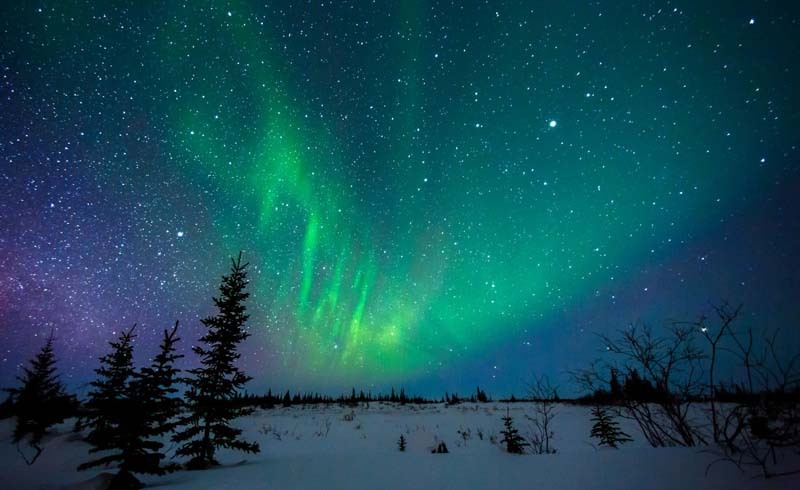 When to visit : August to April are the best months for a chance to see the Northern Lights. If adventure sports are not for you, you can still enjoy the great outdoors, just at a more relaxing pace. Nestled into the winter scenery, you can find the Banff Upper Hot Springs in Banff National Park, which are open year round.. It’s naturally around 102°F, so even in the winter the water is warm enough to enjoy. There’s also a café on site for a warm beverage when you’re done. Canada has no shortage of outdoor winter activities, so make 2019 the year you cross something off of your adventure travel bucket list.